Families, dog walkers, gardeners and local councillors protested against a housing development that threatens a Clouston Street community space. Dressed in woolly animal hats, sporting flowers and carrying home made placards, the demonstrators filed off their buses to form a throng on the red square across from the City Chambers in Glasgow. A springlike sky defied the unseasonal cold, but there was no hiding the anger that burns within the community around North Kelvin, a gap site they affectionately dub their 'meadow'. It's not a huge patch of ground, but it is in a location that makes it attractive enough to lure in developers who hope to create a new community of 90 modern flats on what's known as the Clouston Street side. Once the site of two disused football pitches more abused by dog owners that 11 a side teams, the land fell into neglect, later declared surplus to requirements by the old Strathclyde Regional Council back in 1993. It was never declared a greenfield by the current city council, planning officers instead realising its potential for use for residential property in a metropolis deemed already short of quality housing. Yet there it has lain all these years, until locals decided to adopt it as their own. It started when some planted grass seeds across the 1.4 hectare site. It was followed by the odd allotment, flowers and shrubs being planted. It became a more pleasant place for a stroll and a children's wood. Kids play there still, giggling away during their games of tag or hide and seek. Dog walkers still use it for their daily needs, but are careful to scoop up afterwards. The community have grown attatched to it. They've grown used to it. Which all goes some way to explaining why, now when someone else has shown an interest, a storm of protest has been whipped up by those who feel something is being taken from them. That they will be deprived a patch of the dear green place they've learned to call their own. It is why the vocal North Kelvin Meadow Campaign supporters chose the day of the full Glasgow City Council meeting to stage their latest a protest against its redevelopment, right on the city's own front lawn at the city chambers had such a thing still existed. They arrived at George Square by 11.45am, megaphones at the ready and placards waving wildly. This was their chance to not just be heard but seen. Or so they hoped. 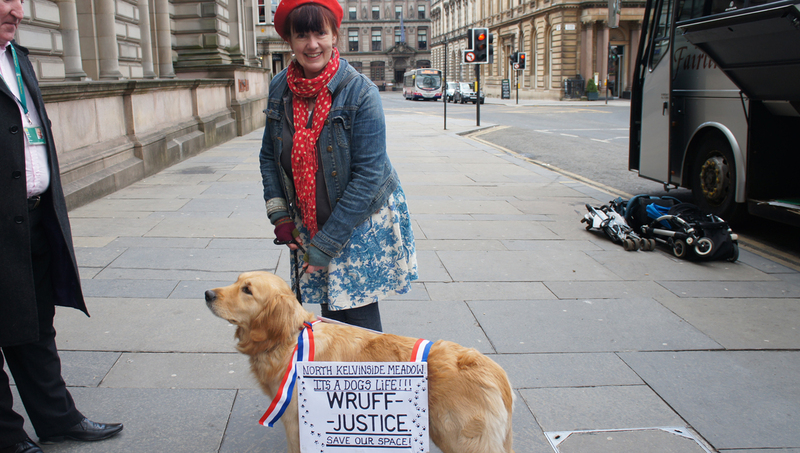 If nothing else, these campaigners know how to capture attention, winning the backing of politicians such as Patrick Harvie and celebrities including artist Alasdair Gray and comedian Frankie Boyle who have all publicly denounced the development plans for the area. But this protest was different, this was all about the people who live there, who feel invested in the 'meadow'. Teresa Lowe was there with her dog Tilly. She said: "We've used the meadow ever since Tilly was a puppy. She's two and a half now. But it's not just for dog walkers, this is a chance for Glasgow City Council to be imaginative and forward thinking. "There's too many gap sites in the West End becoming over developed and it's a fantastic community resource. It's bringing everyone together - young people, old people, councillors are involved. "It's a beautiful gap site, the West End has a lot of tenements, very high density population and these gap sites are getting overdeveloped." Rachael Lyon, who protested with her daughter Eva Forbes, three, said: "We think it's a really really important space. "I don't drive so we can't get out of the city very easily and there aren't wild spaces like that anywhere. Eva loves being able to play somewhere wild and free." 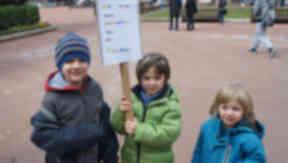 Bang on cue and a group of three children, there mixing with the adults, chanted "Save Our Meadow" through a megaphone. They laughed and told how much fun they had playing in the space, before being distracted by another game. Just like children do. Emily Cutts, chairperson of the Children’s Wood, argued that the wider social benefit to having an open area like this in the community outweighed that of commerce. She said: "There’s absolutely nothing else like it. It’s not just a space – you are part of it. People talk, discuss, have conversations in a community like this. "Some people grew up on the islands and they say they have the same feelings in the Children’s Wood as they did growing up there, knowing everyone in their community. "We work with schools and one or two children said they hadn’t played outside all year, but they played on their Xbox. Nature is so good for adults too, it’s really positive. "People say they feel relaxed when they bring their kids to playgroup." Emily and a 40-strong team of Children’s Wood volunteers told how they help host events on the site, including readings from children’s books by famous authors and even reindeer visits at Christmas time. Volunteers, they said, do everything from bringing home-baking, handing out flyers and ticketing events in order to keep the Children’s Wood alive. 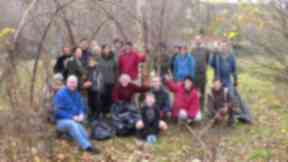 They have now joined gardeners, dog-walkers and other supporters of the North Kelvin Meadow Campaign in sending queries to Council Leader Gordon Matheson about plans to develop on the land. "We want Gordon Matheson to answer the questions we’ve sent him," said Emily, "The presence of kids, campaigners, councillors and MSPs at the demonstration will say something about why the land is so important to the community." "The decision could happen any day – but the developers need to provide more information. It’ll rip the heart from the community, there’s nowhere else the community can meet." The site was recently awarded third place in the Scottish Civic Trust My Place Awards, a competition that recognises the buildings, landscape and civic projects that make a positive impact on local communities. While a recent survey carried out by Glasgow University resulted in 93% of locals voting against the build. The results of the poll will be sent to the planning officer, developers and the North Kelvin Meadow Campaign. 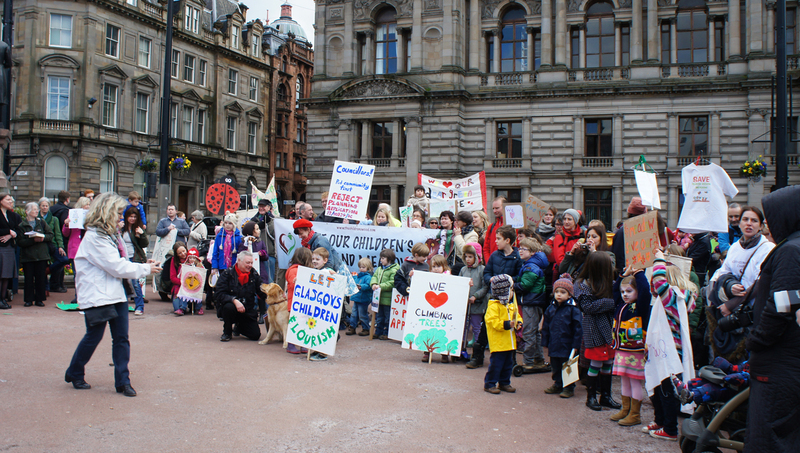 "The Glasgow University vote goes to show the level of support," said Steve Greenland, a father-of-one and Secretary of the Children’s Wood, "We didn’t have an active campaign. "We suspected the result would be in our favour but we didn’t know there would be such strong support from people in the local area. It shows people value the land so much." The council says nothing has changed over its intentions, having included an element of housing in any use as part of all its most recent development charters. It argues monies raised from the sale have been reinvested in the community, developing other play areas, and that any offer was in the best interests of the cash strapped local authority and city it serves. They also stated that current plans have already been subject to some widespread consultation, including a day devoted to the local community. They previously explained in this story by STV Glasgow, the background to the planning process surrounding the area. The flats application would be considered in due course, a spokesman said. But the campaign looks like it may continue for sometime yet.